At a press conference today in New York, Yahoo CEO Marissa Mayer announced a revamp of the photo sharing site Flickr. The new version of the site, which is already live, has undergone a visual overhaul that eliminates a lot of extraneous information in favor of a mosaic of large photos. Images can now be easily shared on Facebook, Twitter, Tumblr or Pinterest with a touch of a button. Data storage limits for free accounts have jumped from 300MB to 1 terabyte (the equivalent to over 1,000,000 megabytes). "That's 70 times bigger than what anyone else is offering...537,731 photos in full quality," according Yahoo SVP Adam Cahan. In addition to the free option, all ads can be eliminated for $50/year and an extra 1TB of data can be purchased for $500. Flickr has fallen behind the competition since Yahoo acquired it in 2005, but now the service is looking to win back mobile users who may be using services like Instagram or Google+ because of their mobile integration. To this end, Flickr has overhauled its Android app (free on Google Play) to mirror all the new functionality recently added to its existing iOS app (free on iTunes). And their new web design is very mobile-friendly for easy access from any tablet or phone. 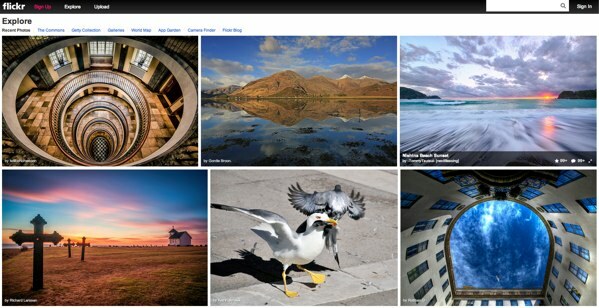 Flickr, always a strong option in free photo hosting, may have just become one of the best.